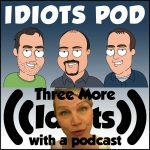 Episode 21 included Steve, Bob and Joe discussing the days news. Steve's sister JC joined us for another episode of "Trivia Time!". Copyright © 2019 Idiots Podcast. All Rights Reserved.